In over 200 communities across 27 states, we work closely with schools, social services, businesses and thousands of volunteers to get young people the things they need to learn and grow: mentors and tutors, after-school help, family services to stabilize the home. Without these basic supports, kids in need or at-risk are far less likely to succeed and grow into productive adults. 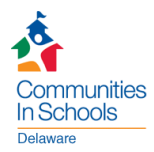 Communities In Schools: the only dropout prevention program in the nation proven to increase graduation rates. Download the policy brief and ICF Executive Summary.